For more than thirty years, the legendary Bruce Ames, PhD, whose more than 450 scientific publications have resulted in his being among the few hundred most-cited scientists in any field—he certainly qualifies for, and has, his own entry on Wikipedia9—has been conducting research focused on tuning up mitochondrial metabolism to optimize health and longevity. Niacin (vitamin B3): The coenzyme nicotinamide adenine dinucleotide (NAD+) is derived from nicotinic acid (vitamin B3) and is required for reactions in all three phases of energy production: glycolysis, the Krebs cycle, and Complex I of the electron transport chain (ETC). Biotin: also a B vitamin and required for heme biosynthesis. Heme is the major functional form of iron and is synthesized in the mitochondria. Pantothenic acid (vitamin B5): Acetyl coA, the product of glycolysis that becomes the initial compound in the Krebs cycle, is synthesized from B5. B5 is also needed for heme synthesis. Pyridoxine (vitamin B6): required for heme biosynthesis. Riboflavin: This B vitamin is integral to succinate dehydrogenase (aka succinate-coenzyme Q reductase or Complex II), the only enzyme that participates in both the citric acid cycle and ETC. Riboflavin is also necessary for the activity of NADH dehydrogenase (aka Complex I of the ETC). Ubiquinone (CoQ10): The carrier of electrons between Complexes I and II and to Complex III in the ETC. Magnesium: Required by the Krebs cycle enzyme, isocitrate dehydrogenase. Iron: An integral component of all four complexes of the ETC. NADH dehydrogenase (Complex I) contains 8 iron-sulfur clusters. Succinate dehydrogenase, contains 3 iron-sulfur clusters and a heme group. Cytochrome c, which transfers electrons between Complexes I and III, is a heme protein. Complex III, coenzyme Q:cytochrome c-oxidoreductase, which is sometimes called the cytochrome bc1 complex, is made up of three subunits, 2 of which contain heme and one of which has an iron-sulfur cluster. The enzyme cytochrome c oxidase or Complex IV, the last enzyme complex in the ETC, contains 2 hemes. Heme is the major functional form of iron and is synthesized in the mitochondria. Heme biosynthesis requires vitamin B6, riboflavin, biotin, pantothenic acid, lipoic acid, and the minerals zinc, iron, and copper. Cysteine: Cysteine, an amino acid, provides the sulfur component of iron-sulfur clusters is therefore also required by all four complexes of the ETC. Copper: Heme biosynthesis requires copper. Complex IV, the last enzyme complex in the ETC, contains 2 copper centers. Zinc: required for heme biosynthesis. While their mechanisms of action differ, acetyl L-carnitine and α-lipoic acid complement one another, in some cases synergistically. In addition, α-lipoic acid is a potent inducer of the ~200 Phase II enzymes with antioxidant activity, including those required for the synthesis of GSH, the body’s most important intracellular antioxidant. As noted above, when old rats receive high levels of both acetyl L-carnitine and α-lipoic acid, within several weeks, the combination greatly improves mitochondrial function, resulting in restoration of ambulatory activity and cognition (as assayed with the Skinner box and Morris water maze), heart, and immune function to levels seen in young rats. 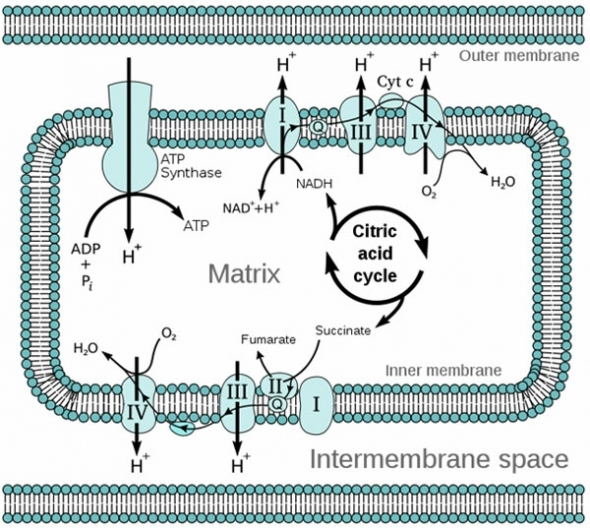 The KM Concept: Key to Mitochondrial Decay? Ames also targets iron and vitamin B6 as two common nutrient deficiencies that accelerate mitochondrial decay.20 Heme biosynthesis occurs predominantly in the mitochondria. Iron insufficiency disrupts heme synthesis resulting in loss of Complex IV and, as a result, significantly increased release of oxidants. Iron deficiency is fairly common among menstruating women in the U.S., 25% of whom ingest ≤50% of the DRI. Vitamin B6 deficiency, also not uncommon (10% of Americans ingest ≤50% of the DRI), can also cause heme deficiency since heme biosynthesis requires B6. A further consideration is that menstruating women may be using oral contraceptives, which have repeatedly been found to be associated with significantly lowered levels of vitamins B6 and B12.21 Ames notes that insufficiencies of iron or B6 are likely to result in accelerated aging and neural decay. While it has commonly been thought that Americans’ intake of essential micronutrients is adequate, evidence indicates that damage occurs at levels higher than those that cause acute deficiency disease. In addition, as many as one-third of all single nucleotide polymorphisms (SNPs) in a gene result in the corresponding enzyme having an increased KM (decreased binding affinity) for its coenzyme, and therefore a lower rate of reaction. Given that some of these SNPs (to be discussed in Part II of this review: The Methylation Transsulfuration Connection to Mitochondrial Function) are found in ~30-40% of the population,29 it is obvious that higher than DRI levels are necessary for optimal function in significant numbers of people. Dr. Ames’ KM concept applies both to aging-associated mitochondrial dysfunction, as discussed above in regards to acetyl-L-carnitine and lipoic acid, and to inborn (genetic) weaknesses in metabolism. In both cases, the functional capacity of defective enzymes can be ameliorated by administration of high doses of the corresponding cofactors, which raises coenzyme levels and at least partially restores enzymatic activity and mitochondrial function. 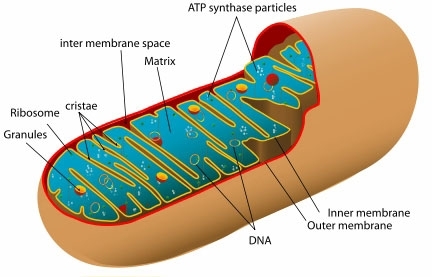 However, a protocol focused on restoration of KM, while certainly helpful in delaying mitochondrial decay, does not address a more fundamental issue – why does human physiology shift from a homeostasic state that repairs and balances itself to one that allows decay to accumulate? A new theory concerning what researcher Wulf Dröge has called “the first cause of death” may provide insight into a vicious cycle responsible for the shift from a state of youthful homeostatic repair to a homeostatic state that promotes mitochondrial decay. This will be the topic of Part III of this review: Reversing the Age-related Metabolic Shift towards Mitochondrial Decay. β oxidation—the process by which fatty acids, in the form of Acyl-CoA molecules, are broken down in mitochondria and/or in peroxisomes to generate Acetyl-CoA, the entry molecule for the Krebs cycle. betaine—in chemistry, any neutral compound with both a positively- and a negatively-charged functional group, so that it carries a total net charge of 0, while carrying formal positive and negative charges, also called a zwitterion. In biological systems, betaines, which are polar and water-soluble, permit water to remain in cells, thus serving as intracellular protectors against osmotic stress. Betaines also serve as methyl donors; trimethylglycine is a betaine. Glutathione—GSH is a tripeptide composed of cysteine, glycine, and glutamate that is synthesized de novo in all cells and serves as the major intracellular antioxidant and redox buffer. pyruvate dehydrogenase—enzyme involved in transforming pyruvate from glycolysis into acetyl-CoA, which is then used in the citric acid or Krebs cycle. 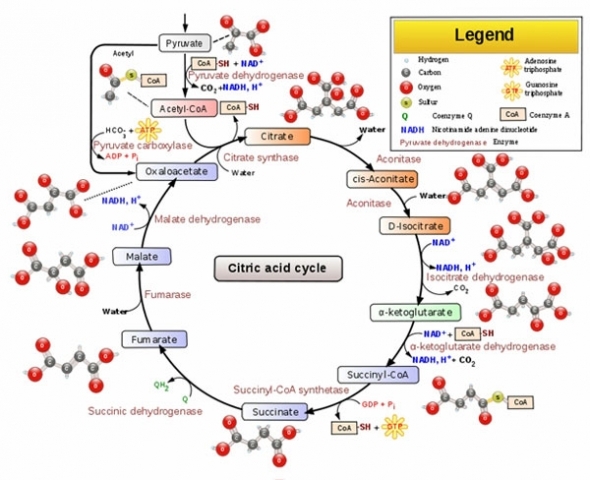 Thus, pyruvate dehydrogenase serves as a link from glycolysis to the citric acid or Krebs cycle, which is followed by oxidative phosphorylation in the electron transport chain of the mitochondria.